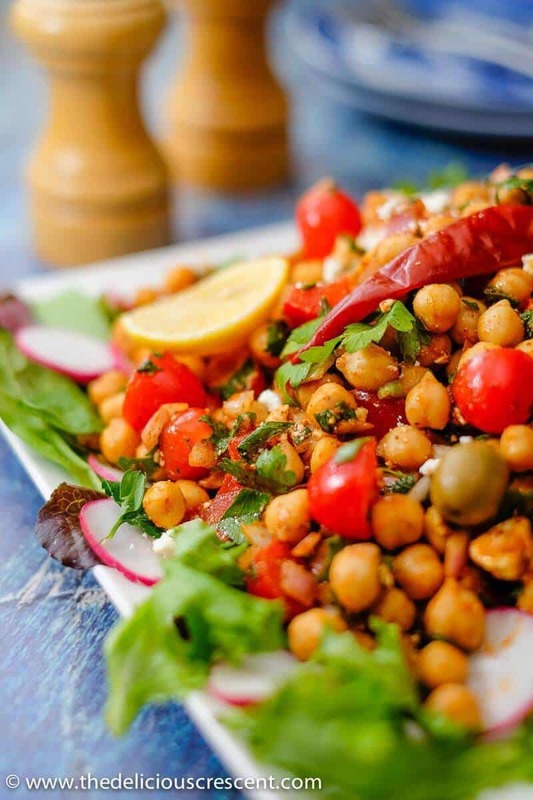 Mediterranean chickpea salad is full of super delicious flavors and textures. It is a healthy and filling meatless salad packed with plant protein and fiber. An irresistible meal ready in few minutes! 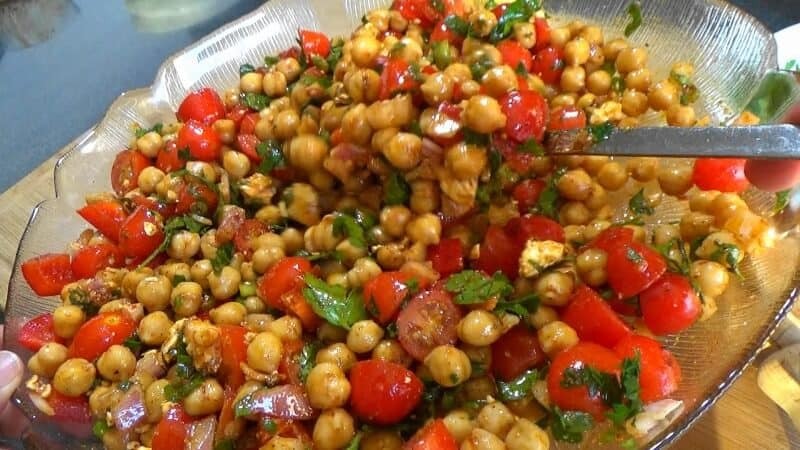 This Mediterranean chickpea salad is inspired by the flavors of the eastern Mediterranean. The aromatic notes of cumin and paprika combined with the tartness of sumac and lemon juice with the pungency of garlic and red pepper flakes results in a piquant salad that is so characteristic of the eastern Mediterranean cuisine. Besides, chickpeas are a popular ingredient in that region. Ideally I like to make the chickpea salad with dried chickpeas that are soaked overnight and cooked until soft and well done. But you may use canned chickpeas too. Then prepare the salad dressing with grated garlic, cumin, paprika, olive oil, lemon juice, salt, pepper. Add red pepper flakes if preferred. Next, mix all the salad dressing ingredients well. 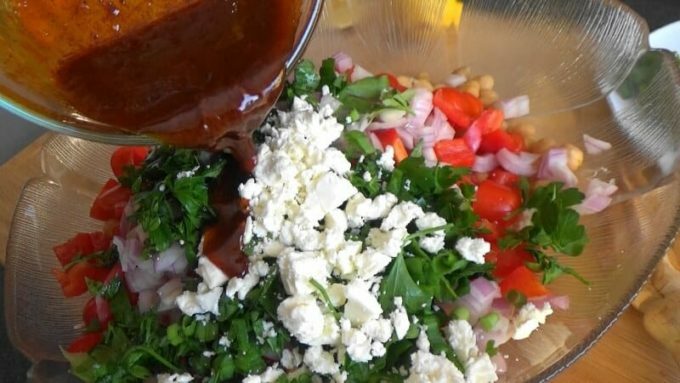 Place cooked and cooled chickpeas, tomatoes, red bell pepper, onion, scallions and parsley in a wide mixing bowl. 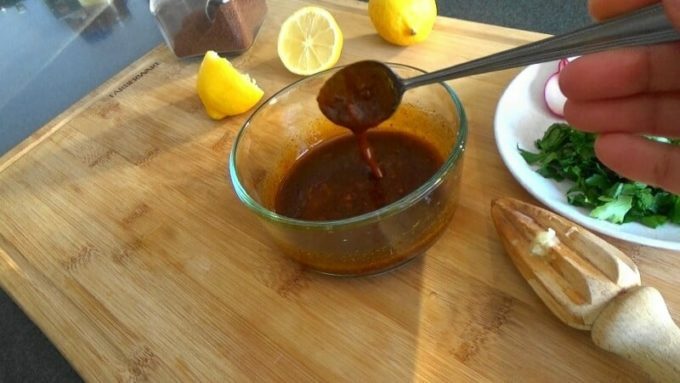 Stir the salad dressing with all the other ingredients. Adjust the seasoning to your taste. Set it aside at room temperature or in the refrigerator for 20-30 minutes. 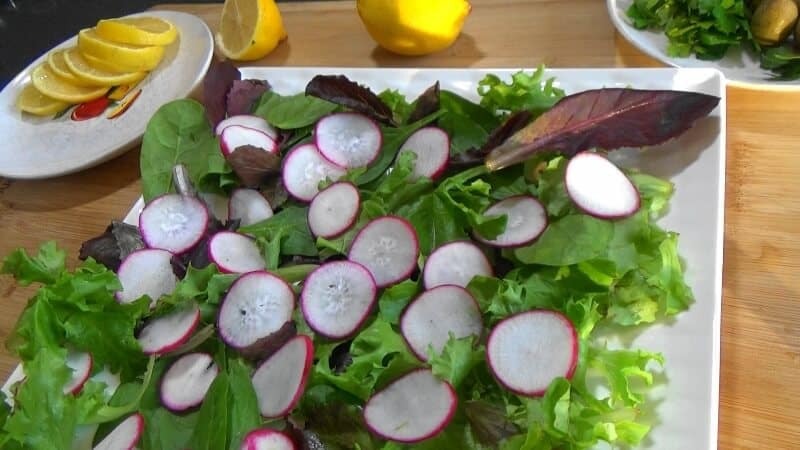 The salad may be served over a bed of mixed salad greens and radish slices. Garnish with crumbled feta cheese, olives and lemon slices if preferred. 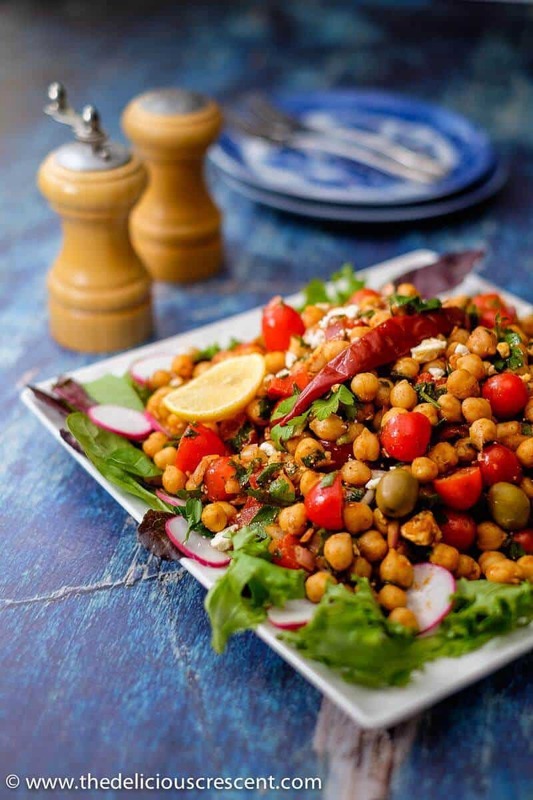 Chickpeas, the main ingredient in this salad are a great vegetarian and gluten free source of protein. The quality of the protein is better than most other pulses and it provides all the amino acids except the sulfur-containing amino acids. A piece of toasted pita bread with this salad would complement the protein very well. The high fiber content and low glycemic index of this bean helps with better regulation of blood glucose. Therefore, it makes an excellent choice for diabetic people. The short chain fatty acids that are produced from the consumption of chickpeas are considered to be very beneficial for colon health. This Mediterranean chickpea salad is simple, gluten free, vegetarian and makes a filling and satisfying meal by itself for lunch. It could also be served as a side at dinner or a buffet. 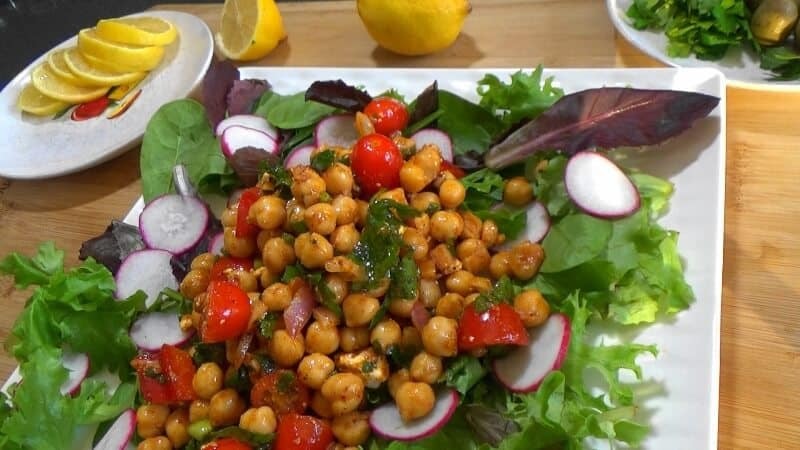 The generous content of vitamin C, potassium, monounsaturated fat and some B vitamins make this Mediterranean chickpea salad very heart healthy. The high dietary fiber, and adequate fat content in this salad provides for good satiety, satiation and fullness, thereby making it an ideal choice for weight management. The other ingredients in this salad, add to the flavor profile of the salad. And further enhance the nutrition quality of it with the additional cancer preventive phytochemical boost. The key is to use fresh herbs and vegetables. 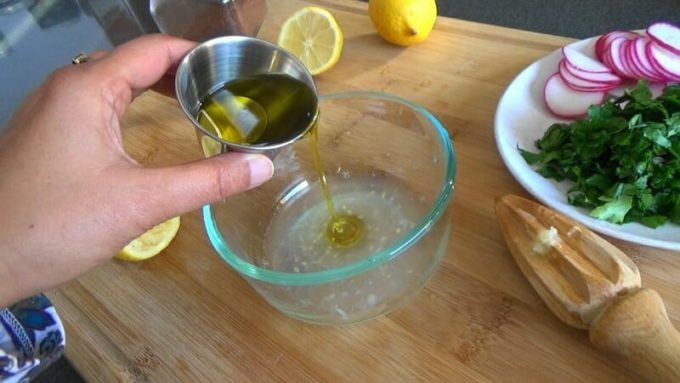 I prefer to use extra virgin olive oil as it is the least processed version and has a more intense flavor. Remember that feta cheese is a salty cheese, so adjust the amount of salt keeping that in mind. Grape or cherry tomatoes have a nice bite and work great for this salad. Have some of the vegetables, cooked chickpeas and dressing ready ahead. But mix the dressing just half hour prior to serving. In fact you can make plenty of salad dressing in a mason jar and have it handy for up to a week. Skip the feta cheese to make it vegan and dairy-free, but you may need to add a little more salt in the dressing. You could add grilled chicken, avocado, and substitute other vegetables. The salad can be filled into a pita pocket and enjoyed too! Storage: The leftovers keep well in the refrigerator for 3 to 4 days. 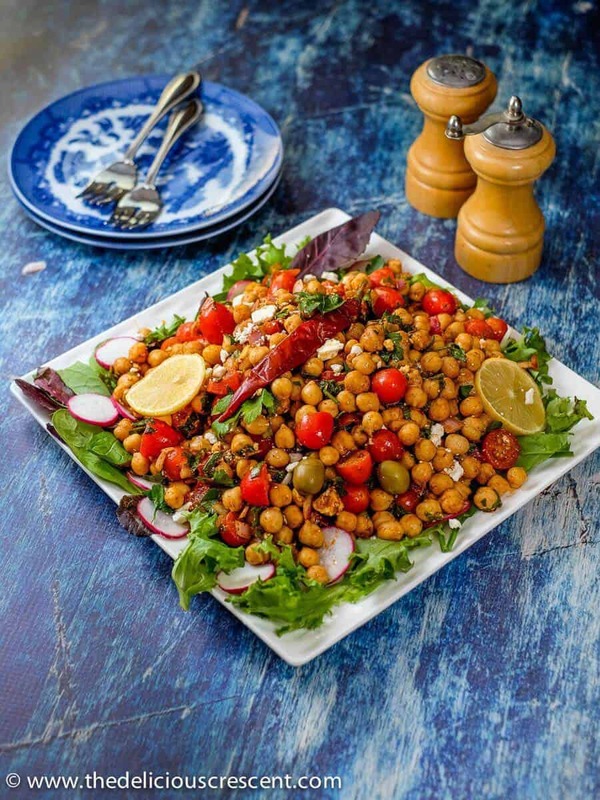 If you like chickpeas and spices, you are going to love this Mediterranean chickpea salad! Bring on some flavors and good nutrition with this easy and hearty salad! Mediterranean chickpea salad is full of super delicious flavors and textures. It is a healthy and filling meatless salad packed with plant protein and fiber. Soak the chickpeas overnight in 3 to 4 cups of water. Drain the water, and rinse the soaked chickpeas. Any leftover water may be drained, or saved to add to other soups and stews. 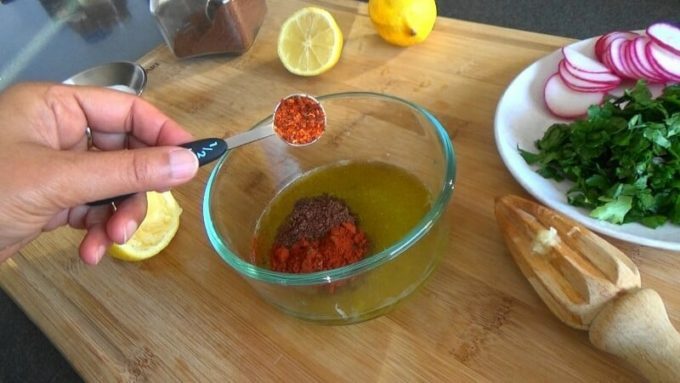 Prepare the salad dressing with the grated garlic, cumin, paprika, olive oil, lemon juice, salt, pepper. The red pepper flakes may be added if preferred. Once the chickpeas have cooled down a little, place it in a wide salad mixing bowl. Add the tomatoes, red bell pepper, onion, scallions and parsley. Stir the salad dressing with all the other ingredients and toss well. Adjust the seasoning as per taste. Let it rest at room temperature or in the refrigerator for 20-30 minutes. The salad may be served over a bed of spinach, arugula or romaine lettuce and radish slices. Garnish with crumbled feta cheese, lemon slices and olives if preferred. Serve with some toasted pita bread on the side. 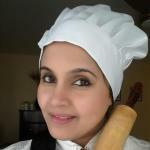 Use fresh herbs and vegetables for best taste. Feta cheese is a salty cheese so adjust the amount of salt keeping that in mind. Sumac, cumin, pickled olives etc are available at specialty and middle eastern grocery stores. For more tips and serving suggestions check out the blog post above.